This is a perfect expedition for those seeking to push themselves towards higher peaks, being nestled comfortably in height between the 6000m and 8000m summits. At 7220m the objectively safe South East ridge of Baruntse is deservedly increasing in popularity. Despite being situated only a few miles from Everest it offers a stunning and remote trek to Base Camp, amazing views of Makalu and a very exposed but technically easy summit day. It is an ideal expedition for those who are interested in going above 8000m in the future yet still offers the logical next step for those who have been successful on a 6000m peak such as Island Peak, Mera Peak or Aconcagua. Climbed on fixed lines with our regular Sherpa team this is arguably the definitive Himalayan expedition. This itinerary is only a guide. Adventure travel in a developing country can be affected by a huge variety of factors including weather, landslides, strikes, breakdowns etc. Our staff will work hard to give you the best possible experience but please be aware there are always some things outside our control. A. Although technically easy, Baruntse is physically very demanding. The extreme altitude, heavy rucksacks and harsh environment mean most people will have to do some training prior to their expedition. Long days in the hills with a 15kg rucksack is the best training supplemented by aerobic training (running or cycling) and some lower body strength training. As a guideline you should be fit enough to manage three long days backpacking in the UK hills covering approximately 40-50 miles. A. Nepal is one of the friendliest and safest developing countries in which to travel. However as it emerges from a decade of civil war there are still frequent strikes and small pockets of unrest. We support the British government campaign: Know Before You Go. This provides invaluable information on any potential risks as well as lots of other useful information. A. You will be supplied with a detailed equipment list on booking but you will require the following specialised equipment: 1) Double mountaineering boots (B3) 2) Crampons 3) Ice axe 4) Climbing harness 5) Jumar 6) 7000m Down Jacket 7) 4-5 season sleeping bag If you are looking to purchase new equipment team members receive a discount at Cotswold Outdoors and Montane. If you need to get any additional equipment in Kathmandu then we recommend Shonas. Their own brand mitts and down booties are particularly good. You will be able to leave any spare clothing and equipment in our hotel in Kathmandu. Please note for our Kathmandu - Lukla flight there is a 15kg checked baggage restriction. A. When travelling in developing countries there is always a risk of illness or accident. Our staff will work hard to reduce this risk to an acceptable level. Our itineraries include extra acclimatisation and spare days in case of inclement weather or illness. This gives us plenty of flexibility to deal with any unexpected occurrences. All our leaders have a current mountain first aid qualification and the expedition will carry an extensive first aid kit. A. This expedition is suited to regular winter mountaineers with some altitude experience, ideally to 6000m (e.g. Mera Peak, Island Peak or Aconcagua). 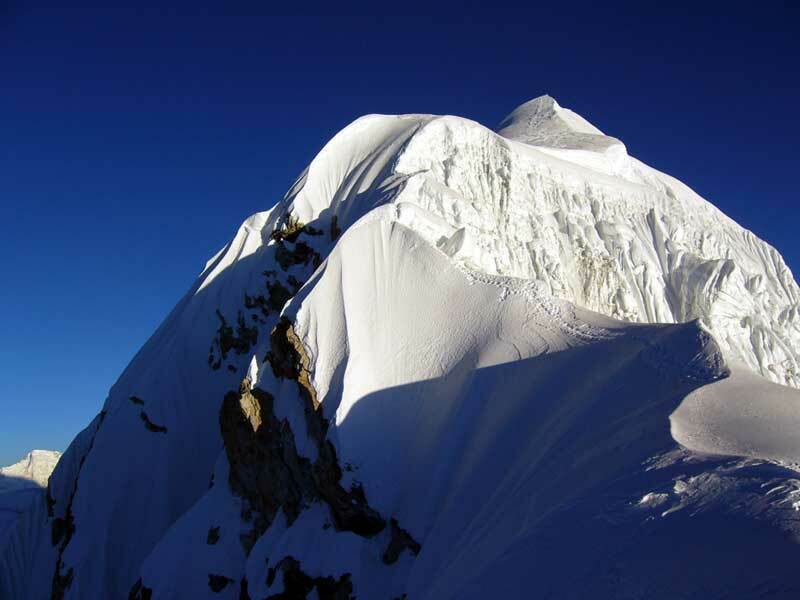 Climbers with a strong alpine background have also been successful on this peak although the effect of the altitude on their performance will be an unknown. Baruntse gets an alpine grade of AD and features plenty of exposed Scottish grade 1 ground with one steep Grade 2 wall at 7000m. Experience on glaciers, crevasse rescue and using fixed lines is useful but not essential as full instruction will be given.